Spring is in the air, and business owners and entrepreneurs alike are wondering how to take their wedding and event businesses to the next level. For all the opportunities they provide, barns that can be used as private event spaces have become a top trend in the industry. 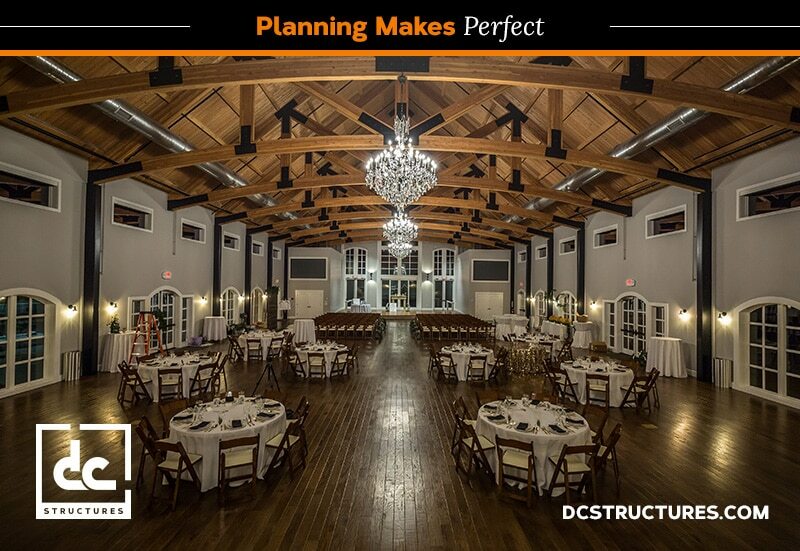 From rustic weddings to company parties, DC Structures knows what it takes to get your event space up and running. Wedding and event barns are a versatile and profitable investment, but like most smart business ventures, they require planning, foresight and upfront costs in order to be successful. While some people might be tempted to wing it on their own, the use of an experienced general contractor guarantees that your project will be executed in a professional and compliant manner. Below are some of the main considerations that go into establishing a private event space. One crucial step in the planning process involves contacting county and state officials to request local guidelines for public venues in your area. Consulting with architects and business owners that are familiar with the permitting process can also be helpful. This will enable you to ascertain whether your property is properly zoned for year-round events, or if local specifications call for expensive safety equipment such as an emergency sprinkler system. Going through the motions to understand and comply with local regulations and permit requirements can be annoying and time consuming, but it’s better to get ahead of any potential hurdles down the road. It’s always going to be more expensive to deal with problems in retrospect than to meet them head on with proper planning. If a wedding and event barn is part of your business plan, you should open a line of communication with your bank or other financial institutions to see what options are available. Many aspiring business owners and entrepreneurs are often surprised to find that they qualify for small business loans and other incentives. Chances are, your bank will also recognize your plans for a private event space as a smart investment with high potential. Between permits and financing to design and construction, building a wedding and event barn is no small task. That said, relying on a general contractor you can trust will go a long way toward easing the burden of getting your private event space off the ground. After all is said and done, you can rest easy knowing your business plays a role in memorable occasions for your customers. Thinking about a wedding and event barn for your scenic property or small business? Request a digital catalog from DC Structures to get started on your dream.